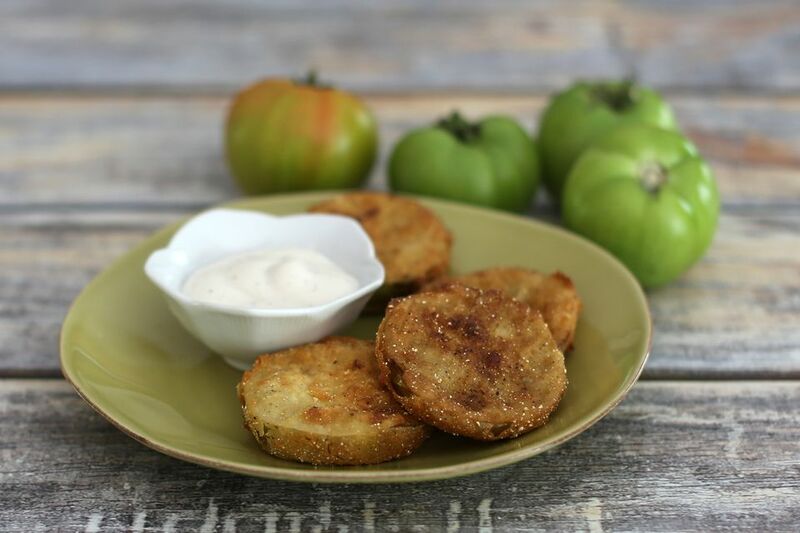 This tried and true, five-star fried green tomato recipe will make you wonder why you've never made fried green tomatoes before! The slices of green tomato are coated with eggs and cornmeal or breadcrumbs and fried until golden, creating a lovely thick crust around a soft—but not mushy—interior. Traditional Southern fried green tomato recipes use unripe (green) red tomatoes that are dusted in cornmeal and shallow fried in bacon fat. Since it can sometimes be challenging to get the cornmeal to stick to the tomato slice, this recipe includes an egg "wash"—which helps the crumbs to adhere—and calls for deep frying. The resulting coating is a bit thicker and may not be as crispy as an egg-free, shallow-fried version, but in no way is it less delicious! Place the flour, beaten eggs, and cornmeal in three separate bowls large enough to fit the tomato slices. Season the tomato slices with salt and pepper. Dust the slices lightly with flour, then dip slices in the beaten egg, letting the excess drip off. Coat well with the cornmeal or breadcrumbs. In a deep-sided skillet, heat a few inches of the bacon grease or vegetable oil to 375 F.
Fry coated tomato slices in batches until browned, turning gently, about 3 minutes each side. Keep the batches of fried green tomatoes warm in a low 200 F to 250 F oven while you cook the remaining slices. Green tomato soup with country ham is a Southern twist on red tomato soup, chock full of ham and tomatoes with a little bit of jalapeno for added spice. Green tomato pickles are sweet and tangy at the same time while green tomato relish will add a bit of spice to any dish. If you happen to find yourself with leftover fried green tomatoes (hard to imagine! ), there are many ways to incorporate into a variety of dishes. For example, take the BLT to a whole other level with a BLFGT! The remoulade sauce adds another delicious surprise to this classic sandwich.